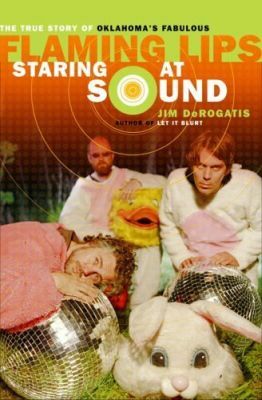 Two lucky winners will receive a copy of Staring at Sound, the new Flaming Lips biography by Jim DeRogatis! The contest is over. We will announce the winner shortly. Now go back to Glorious Noise and patiently wait for the next cool contest. An engrossing and intimate portrait of the Oklahoma-based psychedelic pop band the Flaming Lips, cult heroes to millions of indie-rock fans. In July 2002, the Flaming Lips released an ambitious album called Yoshimi Battles the Pink Robots, which merged elements of orchestral pop, electronic dance music, and old-fashioned psychedelic rock with lyrical themes that were simultaneously poignant and philosophical and supremely silly. The album sold a million copies worldwide, introduced the Flaming Lips to a mass audience, and made them one of the best-known cult bands in rock history. Staring at Sound is the tale of the Flaming Lips’s fascinating career (which, in reality, began in 1983) and the many colorful personalities in their orbit, especially Wayne Coyne, their charismatic and visionary founder. Based on hundreds of hours of interviews with the band, it follows the Flaming Lips through the thriving indie-rock underground of the 1980s and the alternative-rock movement of the early ’90s, during which they found fans in such rock legends as Paul McCartney, the Rolling Stones, Robert Plant, and Devo, and respected peers in such acts as the White Stripes, Radiohead, and Beck. It concludes with exclusive coverage of the creation of the group’s latest album, At War with the Mystics. Cool contest! Im curious about the book!